Today the fragmented medieval ruin of Berwick castle beside the Victorian train station and Royal border bridge is a shell of it's former glory, originally a great Scottish fortress fought over by the Scots and the English for centuries. If it's stones could talk what tales they could tell invasions, massacres, wars, hostage taking and the like. 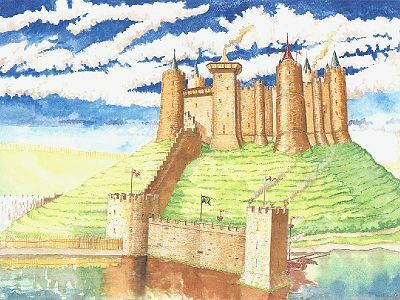 In 1296 King Edward I of England, the "Hammer of the Scots" invaded Scotland besieging Berwick castle and it's town "walls" (actually a wooden palisade). Edward and his army entered the town by surprise spending three days ruthlessly killing almost the entire civilian population. While the castle's garrison led by William "the hardy" Douglas could do nothing in their defence. Sadly this slaughter of innocent civilians is not confined to the pages of the past but has been repeated again and again throughout history. Even in the recent Balkans conflict some 700 years after the Berwick massacre. Edward eventually ended the carnage on seeing a pregnant woman giving birth being hacked to death by his men. The alleged stone of Destiny used to crown Scottish Kings was also stolen from Scone by the English and taken to London. Douglas under duress swore allegiance to King Edward to escape imprisonment, but later in 1297 he joined William Wallace in rebellion against the English invaders. 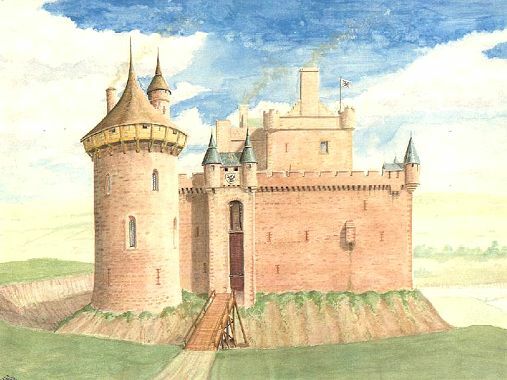 In retaliation his own castle of Douglas in Lanarkshire was stormed by Edward's lackie Robert Bruce (later King Robert I 1306-1329) with Douglas's wife and children, including a young man called James (later Bruce's "Good Sir James" Douglas) taken hostage and handed over to Edward's wrath. Douglas for the sake of his family surrendered and was taken to York castle in chains where he died of ill-treatment in 1302. Three years later Wallace was also captured then hung ,drawn, castrated, disembowelled and beheaded for his campaign of rebellion, with his head placed on a stake above London bridge while the remaining parts of his body were sent North to Scotland for public display. Eventually one of his legs was nailed above the gatehouse of Berwick's town walls as a reminder of Edward's justice and a warning to any would-be Scots rebels living nearby. Likely Douglas's own harrowing account of the Berwick massacre, his inability to protect the civilians and his own death at the hands of the English at York moulded young James Douglas's character into a violent, vindictive killer, whose guerilla campaign against the English earned him the title the "Black" Douglas, a token reference to his dark skin and black hair but more fully a reference to his black nature in warfare. For example he beheaded the entire English garrison in his own castle of Douglas leaving their bodies in the vaults beside spilt grain and wine before setting the castle on fire and for good measure he chopped up their horses dumping the animal parts into the castle's well along with salt to spoil the water supply. The whole event became known as the "Douglas larder". In 1306 the Countess of Buchan was imprisoned in a cage above Berwick's town walls for the crime of crowning King Robert the Bruce. At the same time Bruce's sister Mary was held in a cage above Roxburgh castle, another Scottish monument occupied by hostile English. In 1307 Edward I died en route to invade the west of Scotland. His son Edward II lacking the military prowess of his father turned back to England, giving the Bruce and his "Good Sir James" Douglas time to gather support for their rebellion. 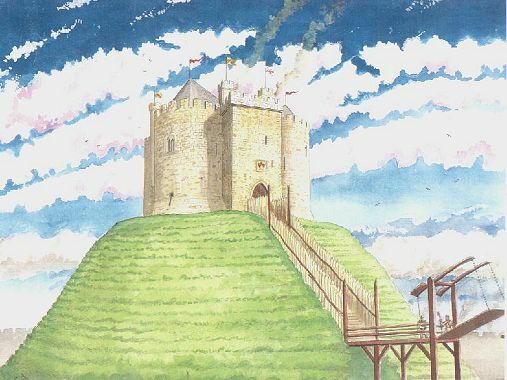 In 1314 Douglas made an abortive assault on Berwick castle, but was successful in taking Roxburgh using the same tactics, attacking at night with specialized rope ladders. Also in that same year the Bruce defeated Edward II's army at the battle of BannockBurn, near Stirling. 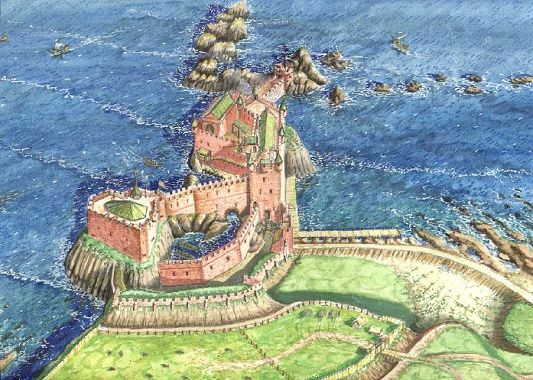 Edward pursued by Douglas fled to the coastal fortress of Dunbar where he and some of his men escaped by boat to the security of Berwick then still in English hands. In 1318 Douglas captured Berwick Town and starved it's castle garrison into surrender in some small way obtaining revenge for his father's death and the massacre of 1296. Though the English did make several unsuccessful attempts to recapture the castle and Town in 1319. In 1329 King Robert the Bruce on his deathbed insisted that after his death Douglas should cut out his heart and carry it on a pilgrimage to the holy lands. Douglas did as he was commanded, unfortunately in 1330 he only got as far as southern Spain, where he died at the battle of Teba. Legend claims Douglas realizing he was going to die, tore the casket containing Bruce's heart from round his neck and threw it at the Moors crying "forward" following his friend into battle for one last time. Douglas's body was recovered and boiled so his skeleton could be returned to Scotland along with Bruce's heart. Douglas was intered at St Brides church while Bruce's heart was taken to Melrose Abbey where it remains to this day. After 1330 the Douglas heraldry was amended with a red heart on their surcoats, shields and banners representing the King's heart and turning Douglas's death at Teba into a legend. In 1333 Douglas's brother Archibald was killed at the battle of Halidon hill, failing to save Berwick town and castle from falling back into the hands of the English led by King Edward III. 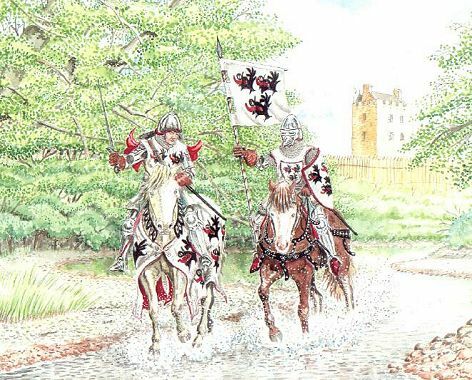 In 1355 Archibald's son William (later 1st Earl of Douglas) with Patrick Dunbar, Earl of March and William Ramsay of Dalhousie routed almost the entire English garrison from Norham in an ambush at the battle of Nisbet, near Duns. Fearing for the security of the token garrison left at Norham the English unwittingly sent most of their troops from Berwick. Instead though the Scots led by Dunbar and against William Douglas's wishes stormed Berwick town setting it ablaze as they were unable to secure the castle and had to withdraw when more English reinforcements suddenly arrived. In reply many Scots villages were burnt. In 1378 squire Alexander Ramsay of Dalhousie with 50 men seized Berwick castle by scaling the walls at night surprising the bewildered garrison who abandoned their posts and fled to Berwick town. Ramsay found himself in a bit of a dilema as the town was still held by Governor Thomas De Musgrave who called on the Earl of Northumberland with his young son Harry (later the infamous "Hotspur" Percy) and an army said to number in thousands drawn from Alnwick and Warkworth to besiege the castle. Ramsay and his men made a stout resistance but lacking sufficient manpower and munitions it was only a matter of time until they would be defeated. The seizing of Berwick castle appears to have been done without the permission of King Robert II of Scots (1371-1390) or the border Lords whose responsibility it was to protect the peace, but also to wage war when the time and prize was right. An organised combined attack on Berwick by the Scots should have involved taking the castle and town at the same time with enough men and supplies to hold both against the evicted English. Ramsay's actions though daring would cause more trouble than they were worth as the English would, by border tradition, have to retaliate in a "eye for eye" policy. So the whole Scots border was on alert for the counter attack which could come anywhere at anytime. Ramsay was not popular on both sides of the border. Despite this his Uncle Archibald "the Grim" Douglas (an illegitimate son of the "Black" Douglas) and Lord Lyndsay of the Byres massed a relief army at Haddington, little more than 500 in number and marched south to Berwick hoping to collect more men on the way. But many of the Scots borderers were hostile to a rescue attempt or diversion to help Ramsay escape as they felt he deserved to be captured by the English for his rash act. When Archibald's army approached Berwick his scouts informed him that the English army encircled around the castle numbered around 10,000 strong with archers, siege engines, heavy horse and ships blockading the river. There was no avenue of escape for his nephew. Archibald then made a lengthy speech to his army praising Ramsay and his men as heros but that in all fairness it would be suicidal for them to engage the English in open battle or attempt a diversion as they were totally outnumbered. Reluctantly the army withdrew heading towards Melrose to support local forces in resisting the expected English counter attack. Archibald's presence had not gone unnoticed by the English as Thomas De Musgrave and several units of heavy horse quickly pursued, catching the Scots just short of Melrose. Fortunately Archibald's army was joined by his cousin William 1st Earl of Douglas with his son James (later 2nd Earl of Douglas) also George Dunbar 10th Earl of March and his vassal Sir John Gordon. During the ensuing battle of Melrose Musgrave was unhorsed and forced to yield for ransom by Gordon. While young James Douglas and other Scots squires distinguished themselves in the fray. With Musgrave and other unit leaders captured, the remaining English not already slain fled back to Berwick with news of their defeat. After the battle William Douglas knighted his son James since he had proved himself in battle. Archibald also knighted some of the other squires in the euphoria of victory and the prospect of much gold and silver for Musgrave and the other hostages safe return. The English complained "the Earl of March and Douglas and the latter's cousin Sir Archibald, are harassing the English Borderers by imprisonments, ransoms and otherwise". Meanwhile Berwick castle with it's walls breached was entered by storm and all the Scots slain aside from Ramsay who was taken hostage as a bargaining chip to be used in ransom deals yet to be made between the Scots and English Borderers. But whose to say the Scots wanted Ramsay back, that in itself is another story. Today the ruin of Berwick castle originally a piece of Scotland is a sad shell of it's former strength, besieged and occupied again and again by the English. Until finally even the border was moved further into Scotland to accommodate Berwick as an "English" castle and burgh denying it's Scottish roots.